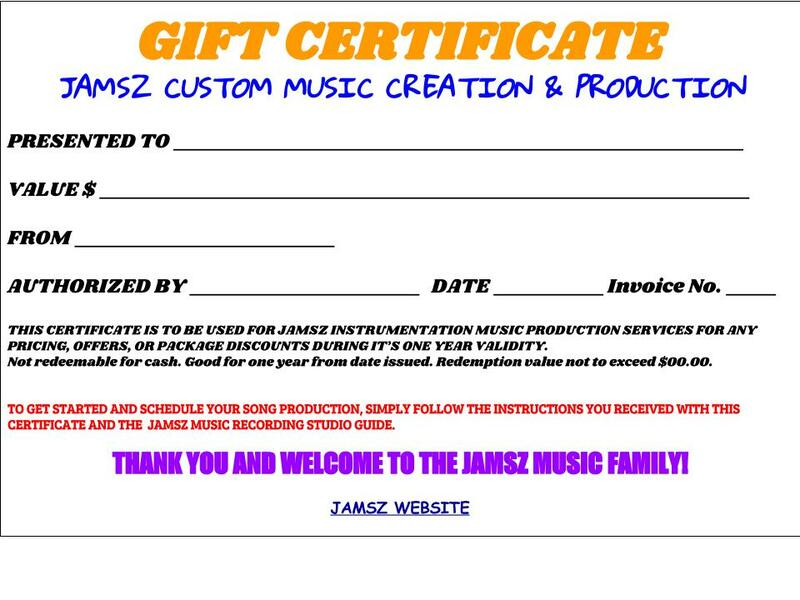 GIFT CERTIFICATE - JAMSZ® providing authentic music for today's singer, musician, film, television, advertising, and multi-media industries. If you want to give the Gift of Professional Full Music Production and purchase a Gift Certificate, then please fill out the form below to get started. You will receive an invoice via email with simple secure payment instructions via any major credit card or paypal account. You’ll also get the options to compose a personal message for the recipient of the Gift Certificate and putting the names you want on the Certificate (Sender’s name and who it’s intended for) e.g. Artist/Band name etc. You will also receive a copy of the Certificate exactly how the Recipient will view it to keep along with your digital invoice for your personal records. I offer a very straightforward process for providing Original Exclusive Broadcast Quality Background Music that Creates Attitude, Character, and Substance for your songs to help them become fully developed exactly the way you want them. Not in my town? That’s OK. I collaborate with you remotely via the internet. ONLINE RECORDING AND MUSIC PRODUCTION HAS NEVER BEEN MORE EASY TO ACHIEVE THROUGH TODAYS TECHNOLOGY AND MY METHODS. YOU WILL RECEIVE A CUSTOM GUIDE OF BASIC INSTRUCTIONS DESIGNED SPECIFICALLY FOR YOUR SITUATION AND AVAILABLE RESOURCES TO OBTAIN PROFESSIONAL HIGH QUALITY RESULTS. I’M ALWAYS AVAILABLE THROUGH THE ENTIRE PROCESS OF EVERY SONG FROM START TO FINISH AND GUARANTEE FANTASTIC MUSIC PRODUCTION FOR YOUR SONGS. There are millions of sites and companies trying to sell their music online, many of which are pre-recorded out of the box samples and loops that are not authentic and created with real instruments by a genuine musician. Finding one you can count on and build a relationship with for the long term is a difficult task. Here are some reasons why you have made the best decision to use me as your collaborative partner in music. The Code: Nothing but the highest standards are accepted. Before any music project is ever considered completed, it’s meticulously ensured that it conforms to all agreed standards. Customer Support is above and beyond! It’s a “no brainer” You’re only working with me, and I only accept the best for you! Tomorrow, I will be here for you. I’m not a misfire music source. I’ve seen other music companies come and go and I plan to still be here years from now. I believe that quality must be measurable, it must be represented in the music and communication of our relationship. I believe I’m only as good as my last musical adventure, that’s why you’ll always receive the greatest outcome that’s available anywhere. And most of all, I offer the highest quality crystal clear music at the lowest cost available and I can meet your current needs! Please enter the email you want the Certificate Invoice sent to for payment. This is optional. Leave the best phone number to reach you at and any questions you have in the message box below. e.g $75, $125, $175, $225. You may also check out the Artists Pricing Page on this website for more details on cost of services. Who's the Gift Certificate for? Please enter the email address you want the Gift Certificate Sent to. You will also have this option after your Jamsz Certificate purchase.